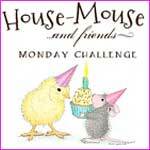 Hos Dorte: H for Holiday Helpers, a DT card for ABC Christmas Challenge. such a lovely card Dorte, love the lights as banner. VERY cute Dorte!!! I love the little lights! Love it - great colours and those Christmas lights look really good. 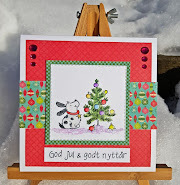 Hi Dorte, what an adorable image and a gorgeous card. Just perfect for our challenge. I found him so qute! And all these colors make your card a happy holiday ;p Thank you for playing with MCC and good luck! Love that little string of bulbs, too cute! Great card!